A South Korean court sentenced former president Park Geun-hye to eight more years in prison on Friday (July 20) after finding her guilty on charges of causing loss of government funds and interfering in a 2016 parliamentary election. 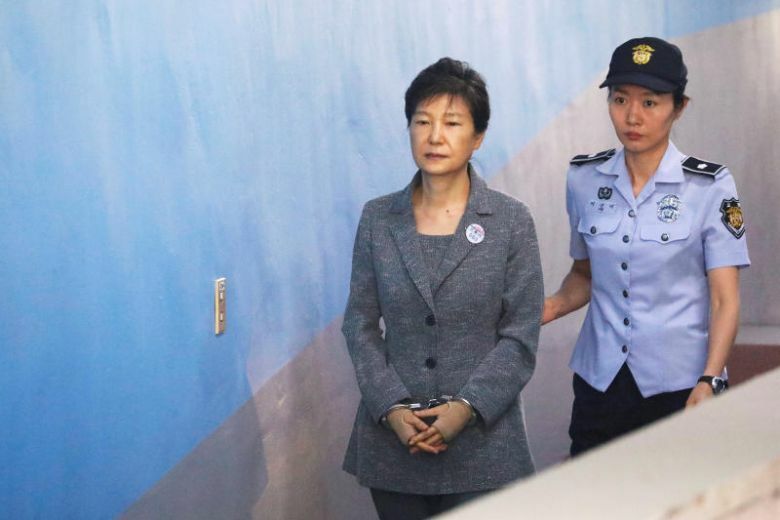 Park has already been sentenced to 24 years in jail after she was found guilty by a lower court in April of separate charges including bribery, abuse of power and coercion. All sentences must be served consecutively if they are upheld, a court spokeswoman said. Park became South Korea’s first democratically elected leader to be forced from office last year when the Constitutional Court ordered her out over a scandal that exposed a web of corruption between political leaders and the country’s powerful conglomerates, or chaebol. The Seoul Central District Court ruled that Park colluded with her former aides to cause the loss of government funds worth about 30 billion won (S$36 million) from the National Intelligence Service (NIS). The money was from a “special activity fund” allocated to the spy agency, totalling 4 billion won every year but exempt from state audits or parliamentary reports. Two of the three former NIS directors involved were sentenced to three-and-a-half years in prison last month, and the third to three years. “Park’s private use of the funds weakened the principles of executing government funds, and barred the country’s chief spy agency from using the funds for its core duty of protecting the country and the people,” presiding judge Seong Chang-ho said as he delivered the verdict. “This even could have caused danger for the country and the people, so a rigorous punishment for the defendant is needed,” the judge said. Park allegedly squandered the taxpayer money on maintaining her private house, financing a boutique where her secret confidante Choi Soon-sil – the central figure in the corruption scandal – had Park’s clothes made and other private purposes, including massage treatment. Park was also found guilty of interfering in the ruling party’s selection of candidates for the parliamentary election, breaching the president’s obligations to honour the party system. An appeal against the ruling can be lodged, Seong said. Prosecutors had sought a 15-year sentence and a fine of 80 billion won for Park.